A lot of time and commitment goes into putting an event like this together. I would like to pay special thanks to the Festival Committee for their time and hard work over the year in preparing this event for the entire community. Also in the organising of the Leixlip Christmas Lights, two events that the Leixlip community can be very proud of. 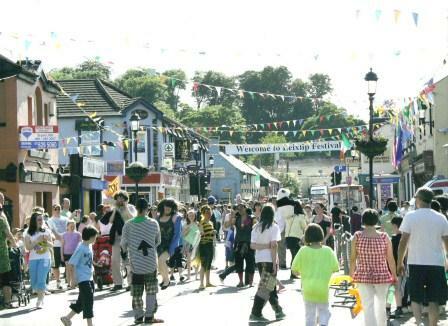 The Leixlip Festival is now one of the longest running community festivals in County Kildare. Sponsorship is a very important feature of organising any event, we are very lucky to have such excellent supporters in financing this Festival. To our main sponsors: Kildare County Council - Hannigan Group - Intel - The Courtyard Hotel - Hewlett Packard - Leixlip Credit Union - Murphys bar - AIB - Bank of Ireland - Sams Takeaway - Spar Main Street, I extend a huge thank you. The Festival also needs the support of a large number of other groups such as, The Gardai - Kildare County Council - The owners of the property used by the Festival during the weekend and especially the committed group of stewards who give their time over the Festival period. Finally, all this has been organised for your enjoyment, I hope you have a wonderful weekend in Leixlip. Keep Leixlip Tidy. Each year it takes a dedicated team of volunteers to run the festival in a safe and efficient manner. If you would like to help out or find out more please dont hesistate to contact us. You can contact us from our About Page or on Facebook. Local, national and international - the Leixlip Festival has it all!